In the United States cotton is deeply tied to its role in slavery and the atrocities committed against African slaves. Gardeners growing cotton today get an important piece of living history. Slaves were forced to cultivate acres of cotton and harvest the fiber from sharp bolls all day long in the hot sun. While no one can truly imagine the horrors African slaves went through growing cotton can help keep their story alive. It’s also worth noting that before cotton was ever grown in the United States it was cultivated for thousands of years in Africa, Asia, and South and Central America where different varieties were first domesticated. We tend to think of Europeans and their descendants who colonized North America as having bred this important important fiber crop when in fact they’ve played a relatively small role in cultivating different cotton varieties. It was instead Africans, Asians, and Native Americans that were the original cultivators of cotton including many colored varieties. Thanks to commercial farming operations if you ask most people what color cotton is they’ll say white. In reality cotton cultivars come in many colors including brown, blue, pink, green, red, and tan. At Southern Exposure we offer 6 cotton varieties including green, brown, tan, and white varieties. In the United States these colored varieties were sometimes grown by slaves prior to the Civil War for use in their own clothing as they were not allowed to grow the same white cotton as their masters. While these older, colored varieties are certainly beautiful most of them have a shorter staple length than most modern varieties making them less than ideal for industrial spinning operations. For this reason commercial growers solely grow white cotton and colored cotton varieties are now relatively rare. This doesn’t mean that colored and heirloom varieties don’t have benefits though. First many of these heirlooms are more drought tolerant and pest resistant than their modern cousins and even though they cannot be spun on an industrial scale they can be used by home spinners and small crafts people. Their natural color also means there’s no need to dye them. Today chemical dyes used for clothing are a major source of water pollution. 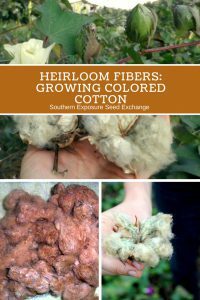 Growing cotton can help connect you with important history even if part of that history is a negative. Cotton is a wonderful ornamental plant and can be used in bouquets at the flowering stage or when the bolls mature. It’s relatively easy to grow and drought tolerant. It can be used for truly homegrown and handmade crafts. 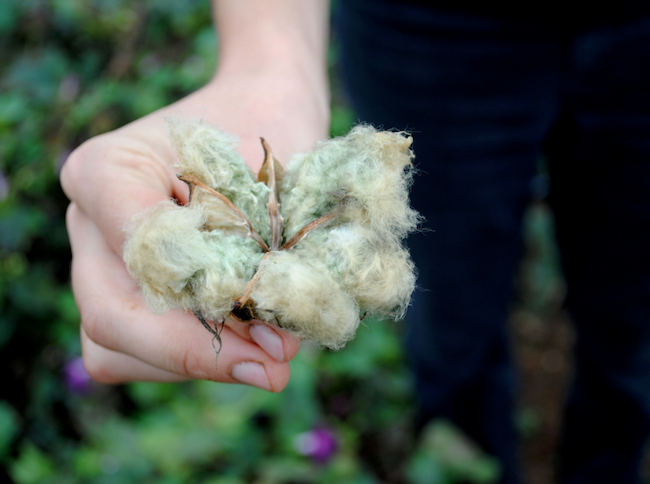 Growing an heirloom cotton helps keep biodiversity alive. These varieties may be important for breeding future varieties. Whether it’s breeding colored cottons with longer staples lengths for mechanized spinning or cottons that are more resistant to certain pests. Cotton is annual and can be direct sown in zones 8-10 after danger of frost has past. Though cotton isn’t grown commercially in the northern United States it can in fact be grown there with a little extra effort. In northern climates (zones 7-5) cotton should be started early indoors like tomatoes or peppers and transplanted out because it is frost sensitive and takes 130 days to reach maturity. For more detailed growing information check out the Southern Exposure Seed Exchange Cotton Growing Guide. *Note: Some states including Virginia require growers to have permits in order to grow cotton. Please check with your local extension agency.